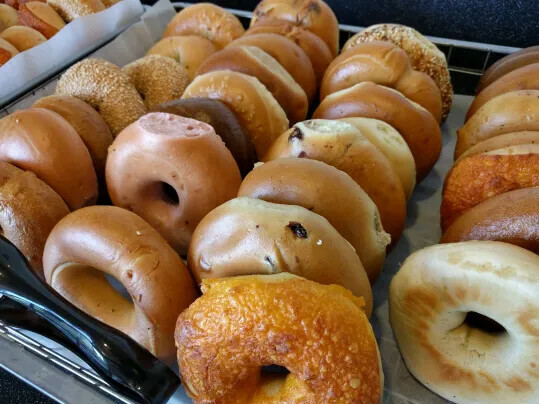 Large U.S. bagel manufacturer located in Southern California is a major supplier of frozen bagels to hundreds of small bagel store franchisees nationwide. This application is a freezer decline for frozen bagels, 36” wide x 100’ long total belt length. The line previously had been fitted with a fabric PVC belt with 2” cleats on 2’ centers. 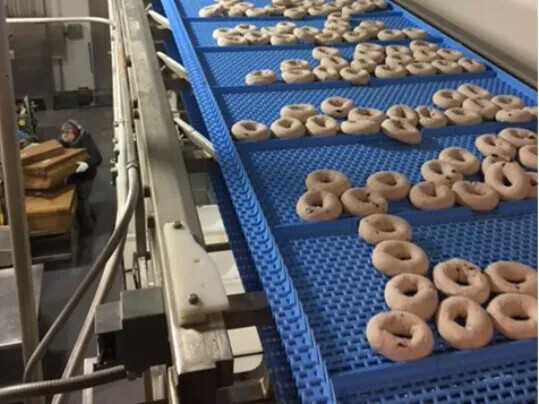 The line is on about a 15% decline; however, the bagels discharged from the top and tended to pile up and/or race down the line; spilling out over the conveyor. Additionally, the orientation into the packaging area would become a mess. Loss of product falling over the sides was a result with too much product being built up on the line. Also, the belt had to be changed every 6 months due to damage from the product or belt mis-tracking off the line. After technical consultation with a Forbo Sales Representative & Prolink Application Engineer; it was proposed to convert the line to Prolink Series 10-36 with a Series 10-36 LRB every 2’ to act as the cleat. The belt would also be fitted with side guards. The customer did the retrofit with new support rails and shafts, and we supplied a S10-36 POM with 10-36LRB every 2’ / 36” x 101’ / with 50mm high side guards. As of this time, the line has performed perfectly. The product does not race down the line nor jump the cleats or sideguards. Product orientation is very smooth feeding into packaging now, and the belt has not had any damage and looks good as new. Belt life will be exceeded greatly. The customer is very pleased and we are their primary supplier on fabric as well as plastic modular belting now due to the success and follow up support by our team.